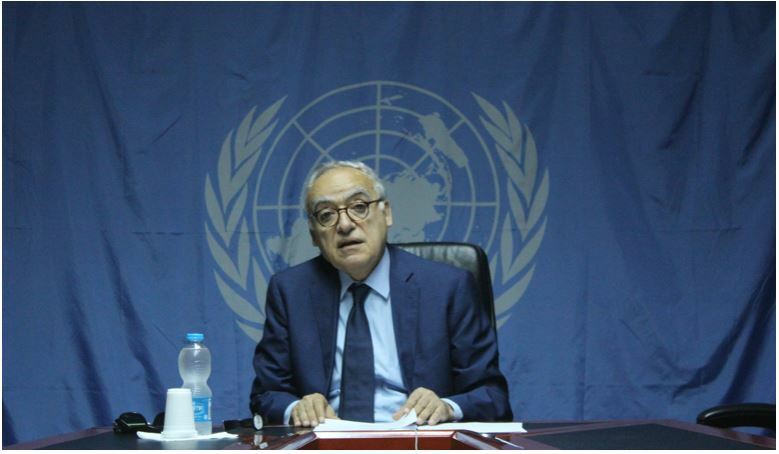 Ghassan Salame presenting his latest report on Libya to the UNSC yesterday (Photo: UNSMIL). 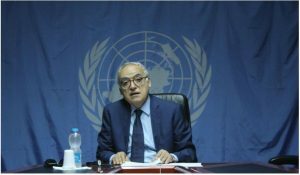 The UN SRSG and head of UNSMIL, Ghassan Salame, said that the planned Libyan elections in December 2018 should only be held if conditions are ‘’right’’. He called on the international community to send ‘‘clear and strong messaging to those who would attempt to stall or disrupt these elections’’. Presenting his latest report on the situation in Libya to the UN Security Council yesterday, Salame gave credit to the military lull in Libya in early 2018 to the UN efforts on the ground. This was evidenced by low civilian deaths and was thanks to the political process and his Action Plan. Salame stressed the need for wealth distribution, economic reform and the fight against corruption to ensure Libya’s stability. He urged that the economy of predation (Libyans eating away at their state and its resources) is broken. He pointed out that a minority of spoilers are benefiting from the status quo and would attempt to delay or disrupt the possibility of elections. Without naming anybody, he added that these spoilers held ‘‘crucial, and too often lucrative, official positions’’. He urged all parties to keep to their commitments and timelines of the May 2018 Paris agreement. Allow me to congratulate Sweden for its Presidency of the Security Council this month. I am grateful for this opportunity to brief you on our work in Libya. For the first months of this year, Libya enjoyed relative quiet from military actions. The United Nations helped create this lull. By reviving the political process with the delivery of the Action Plan for Libya, we provided a peaceful means to be heard and the prospect of obtaining official positions. With this has come increased dialogue and fluidity between the localities and the political camps. The number of civilians killed during the exchange of fire fell to only four in March, and five in April. We capitalised on this positive environment. Let me share four examples. One. We provided a platform for reconciliation agreements and discussion, opening our good offices to all. We have hosted meetings on the most contentious of issues. For example, meetings on land property grievances, and consultations between internally displaced persons and those from the areas from which they have been displaced. Two. We supported the conduct of local elections. They took place in Zawiya on the 12 of May. Voter registration is currently ongoing for similar elections in the towns of Bani Walid and Dirge. Dozens more municipal elections are expected to be held this year. Three. We have re-established the United Nations in Libya; in Tripoli where most of the Mission now resides, and Benghazi where our office will open in the next few weeks. Four. And I am particularly proud of this. We have concluded the consultative phase of the National Conference Process. Over the last 14 weeks, we have held, thanks to our dedicated partner, the Centre for Humanitarian Dialogue, more than seventy-five meetings in Libya and abroad. Over 7,000 Libyans participated, a quarter of whom were women. 2,000 submissions were received online. 130,000 followers have joined the consultative process on social media, generating half a million comments. Digital messaging reached over 1.800.000 persons. Furthermore, the proceedings have been covered in great detail on Libyan media. This bottom-up process is an integral part of the Action Plan. It puts the Libyan people at the heart of the political process, whoever or wherever they may be. For many communities, this was the first time they had been actively engaged in the political process and consulted on the future of their nation. Specific events were held for women, internally displaced persons and youth, while others targeted far-flung communities in the South, abroad, and constituencies previously excluded. The date and the venue of the final event will be determined soon. Political progress is linked to the absence of military activity on the ground. Regrettably, the last two months have been marked by military actions and violent developments; diverting attention and draining some of the momentum we had gained. First, in the eastern city of Derna, where the Libyan National Army moved to take control of the city, leading to two months of battle. The conflict ignited divides across the country, and though the LNA is now in control of the city, small-scale fighting is still ongoing. Then, we had the events in the Oil Crescent. On the 14 June, a coalition of armed groups, reported to include foreign mercenaries, attempted to seize control of the facilities in the Oil Crescent region. They successfully captured the facilities, at the cost of numerous casualties and significant damage to critical infrastructure. The Libyan National Army recaptured the area within a week, in a move most expected to reinstate the status-quo, where the management of the fields would be reverted to the internationally recognized National Oil Corporation, which functions under the Government of National Accord. However, on the 25 of June the Libyan National Army announced that it would transfer management of the oil facilities in the Oil Crescent and of other areas under its control to a non-recognized National Oil Corporation that exists in the East under a parallel authority. Subsequently, the official National Oil Corporation instituted force majeure upon the oil terminals in Sidra, Ras Lanuf, Hariga and Zuetina. As a result, 850,000 barrels per day of crude oil were blocked from being exported. It is estimated that Libya lost over 900 million US dollars. The course of events drove a wedge though the middle of the country, deepening division between institutions and regions. The Secretary General released a statement on the matter, and reminded all of the applicable Security Council resolutions, while offering the good offices of the United Nations. I have spent the last two weeks reaching out to the various Libyan actors, shuttling to find a solution to this misguided crisis. I was not alone in this; the efforts and support of many Libyans, and numerous member states were invaluable. On the 11th of July, control reverted to the National Oil Corporation, and production resumed. The end of the immediate crisis has brought a collective sigh of relief; but it is not the end of the matter. The events have brought to the fore the underlying issues which plague the country and which I have repeatedly outlined to this Council. Namely, frustrations with regards to the distribution of wealth and the endemic plundering of resources. If these matters are not expeditiously addressed, I fear the agreements made to resume the production of oil will not hold, and it will be difficult to advance the political process. The Mission will redouble its efforts to push for economic reforms, as the very stability and unity of the country are at stake. If there has been a silver lining in the events, it is that the various authorities in Libya now accept that they need to take action to protect the country’s wealth. The request submitted to this Council by the Government of National Accord for a review of the official Central Bank of Libya and the parallel Bank in the East, is a welcome first step to bring transparency to the finances of Libya. I encourage you to look positively upon the request. If the economy of predation is to be broken, its methods must be laid bare, and for this Libya needs all our support. Libyans long to be rid of their current patchwork of institutions. The National Conference consultations taught us that the Libyan people want clear and effective leadership by legitimate bodies, formed through elections. It is telling that while only 600,000 people voted for the House of Representatives in 2014, already one million have newly registered to vote in the next elections. However, a handful of people defy this popular desire. The few who benefit from the status quo will, if left unchecked, do whatever they can to hinder elections. Unfortunately, they can do much, especially as they hold crucial, and too often lucrative, official positions. Without the right conditions, it would be unwise to conduct elections. Without clear and strong messaging to those who would attempt to stall or disrupt these elections, the conditions will not be met. To the leaders of Libya, I say, it is time to return control to the citizens. At the international meeting in Paris on the 29th of May, the Prime Minister, the heads of Libya’s House of Representatives and High State Council, and the head of the Libyan National Army committed to engage constructively to enable elections to take place by the end of the year. This deadline is congruent with the Action Plan. I urge you to stand by your commitment, and for others to join you. Furthermore, the deadline that you agreed upon for the production of the legislation necessary for elections is fast approaching. While we welcome the resumption of deliberations by the House of Representatives on the 25 and 26 of June, and again today, on necessary legislation for a referendum on the constitutional draft, these are not enough. It has been evident that many members of the House of Representatives, who last month completed their fourth year in office, have not exhibited any enthusiasm for attendance, nor for passing viable electoral legislation. Members of the House of Representatives should take notice. Libyans are demanding elections, and are becoming impatient with those who find multiple ways and means to postpone this moment. I recently met with the Speaker of the House. He promised a vote on a law for the referendum of the constitution within the next two weeks, and that electoral legislation would be voted upon immediately after. I truly hope this pledge is kept, this time. I urge the member states of this Council, to press the House of Representatives to deliver on its historic responsibility and achieve this goal in a timely fashion. Both experts and the public agree a clear constitutional framework is a national priority. However, they are divided on how to proceed. Many would like to see a referendum on the current draft Constitution; while others completely reject this text. It is a complex issue with no easy options or straightforward solutions. It is exactly because of this complexity that the international community must show unity. Once we reach a reasonable conformity of views among the Libyans, we are working on, the international community must stand together behind this Libyan vision. If even a single member state chooses to act alone, I can say, the process will go nowhere. Technical preparations are proceeding for the elections due at the end of this year. Offices are being readied and planning is moving swiftly. Electoral security arrangements are being worked on, including by the newly established unit for these matters within the Ministry of Interior. While the terrorist attack upon the High National Election Commission devastated much of their headquarters, I am pleased that on the 12th of June the Commission was granted a new compound. There is much work needed to make the premises ready, and accordingly concerted efforts are being made by the Government, United Nations and international partners to renovate the buildings and replace the many items destroyed during the attack. I am happy that, yesterday, the Government of National Accord approved 66 million Libyan Dinars to fund the elections. The United Nations Security Council decision to impose sanctions on six leaders of human trafficking networks was a positive step towards accountability for exploitation and human rights abuses. This progress notwithstanding, impunity still reigns in Libya. Civilians continued to bear the brunt of the escalation of fighting and violence, as witnessed over the past two months in Derna, as it has elsewhere in the country. I reiterate the call on all parties to the conflict to fully respect international humanitarian law, including by taking all feasible precautions to protect civilians and to ensure that the wounded and sick, both civilians and those who have participated in hostilities, are cared for, including through medical evacuations. As in the other areas of Libya where conflict has erupted, the United Nations Humanitarian Coordinator and partners are providing humanitarian assistance. Despite access being hindered, lifesaving materials have been delivered; such as medicines by the WHO and assistance to displaced persons, including 1,000 kits for children. Further assistance will be required, particularly in the areas of health, shelter and mine action. Regarding the city of Tawargha, there have been only a small number of returns. The conditions for a safe and dignified return are not yet sufficiently in place, as basic infrastructure and services are lacking. At the start of this month demining teams were finally allowed to enter the area and commence their work. The current situation of IDPs is unsustainable from both a political and financial standpoint, given the lack of available resources to support them. They should be given the right to integrate in their host communities, as efforts are made to facilitate their return. Libya urgently needs to reverse the deterioration in public services delivery. The United Nations is working with the Libyan authorities, particularly with municipalities across the country, to address these challenges. However, without a resolution to the underlying economic ills in the country, it will always be an uphill battle. The human rights situation and the humanitarian needs of migrants, refugees and asylum-seekers remain dire, and while there have been some improvements in the official detention centres, there are many unofficial installations to which we do not have access. I have been grateful for the continued support of the members of the Council and of key members states actively engaged to support an end to the crisis in Libya. I warmly note the arrival of my new Deputy, Stephanie Williams, as a further reinforcement of our efforts. The status quo in Libya cannot be sustained. The country is in fact, in decline. The crisis in the Oil Crescent gave us a glimpse of what is in store if tangible progress is not made now. Economic collapse, the breakdown of public services, and more frequent and intense outbreaks of violence. In a country where terrorists lurk, where criminals are waiting to traffic migrants, where foreign mercenaries are increasing in number, where the oil industry hangs in the balance, this should be of concern to all. If we are to avert this and support the Libyan people to chart a course to the future they deserve, the unified support of this Council, Member States involved in Libya and our partner regional organisations, is vital.